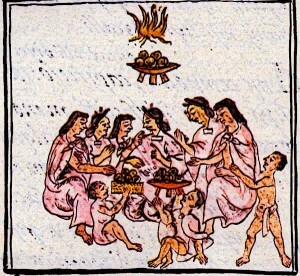 Aztec daily life revolved around the family unit in which the husband was responsible for working outside the home, mostly on agricultural farms, or as a warrior in the case of the nobility. The wife remained in the house and did cooking or weaving. Mayan children were educated by their parents in the early years but they were later send to a temple for religious education and military training. 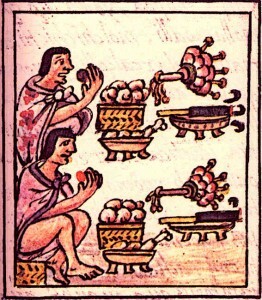 Poor Mayan people in Aztec society worked mostly on farms. They lived in sparsely-furnished huts and were forbidden, by law, to wear or own anything that was decorated with feathers. The poor were also forbidden from owning any form of art and those who violated these laws were accorded death. The children of the poor, as those of the rich, were sent to a school which was associated with the temple. The nobility in the Aztec Empire typically owned many slaves and lived in large houses made of stone. Many houses of the nobility had two stories and were often located at choice spots of the city, such as near pools. The nobility also had arrangements for a steam bath at their homes and wore clothes richly embroidered and decorated with feathers. Aztec laws were detailed and complex so that they overlooked all aspects of the lives of the citizens. The Aztec had laws related to the class system, marriage, social conduct, education, family life, divorce and public behaviour. These laws varied somewhat from one city of the Aztec Empire to another, since each city also had cultural distinctions of its own. Education was considered a critically important part of the Aztec culture. Until the age of 10, kids were educated at home. Then at 10, every kid in the Empire was required to attend school. Schools were divided along class lines, with separate schools for the poor, the nobility and slaves. Kids were taught laws and proper social behaviour at school. They were also taught religious songs. Later in the educational process, boys were taught farming, fishing, hunting and fighting while girls were taught cooking and home-keeping. Specialised training and education were also given to students with special talents, such as those who excelled at healing or showed a talent for art. The Aztec were fond of athletic games which were also their chief entertainment. Among these games, two were most popular, namely the ball game and the flying bird game. The ball game was played with two teams of players, each of whom had to push a rubber ball across the centre line towards the opposite team in order to score. Throwing a ball through hoop situated at a height of 10 feet earned extra points. In the flying bird game, players climbed to the top of a pole and after tying a rope there, flung themselves at the end of the rope and off the pole, flying like eagles in the air. Aztecs specialised in a number of trades. The regular occupations included farming, hunting and fishing. However, other specialised trades existed which formed the bedrock of the Aztec culture. 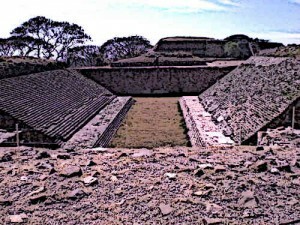 These included highly trained soldiers who served as warriors in the Empire’s battles, traders and merchants, doctors who could heal a whole range of health issues and specialised in the making of medicine, engineers and builders who helped create temples and other architecture of the Tenochtitlan city. Aztec warriors trained extensively in the art of fighting. They underwent proper military training. The warriors from the noble classes were later also educated by the priests in politics and history. The best warriors were deemed jaguar or eagle warriors. Jaguar warriors wore jaguar skins while eagle warriors wore fledged helmets with open beaks. Aztec children were home-schooled until the age of 10. They were then sent to schools depending on the class they belonged to. The children were also required to play their part in the chores of the house. The life of the Aztec women revolved around house-keeping. They were trained in cooking and weaving. In some cases, such as women from the nobility, women could also look after the business if their husbands were away at war. Aztec homes for the nobility were made of sun-dried bricks or stones, were spacious and often located near pools and flower beds. Homes for the poor comprised of huts and included tiny gardens where the poor could grow their own food. Aztecs had no prisons, so any actions deemed criminal offences were dealt with swiftly, quite often with death. Killing others, stealing crops of another person or being publicly found drunk were considered grave crimes. These crimes were dealt with at local courts and if the case was complex, for instance if it involved a nobleman, the case was tried by a court at Tenochtitlan. Often, the death penalty was accorded for serious crimes although lighter sentences were given to first-time offenders who committed minor crimes. Some criminals were sentenced to slavery as a punishment. Aztec daily life centered around the benefits of the community. Religion served as a strong binding force, the class system established a social hierarchy and education was compulsory for everyone so that Aztecs were able to provide professional personnel for various occupations. A detailed system of laws was provided by the Aztec priests and the Emperor, which was based on swift punishments and strict adherence to rules for all, including the nobility. There was a marked difference between the living standards of the poor and the nobility, even the ownership of art was limited to Aztec nobility. Warriors were among the most prestigious Aztec occupations, as well as the skilled occupations such as craftsmen, engineers and builders.